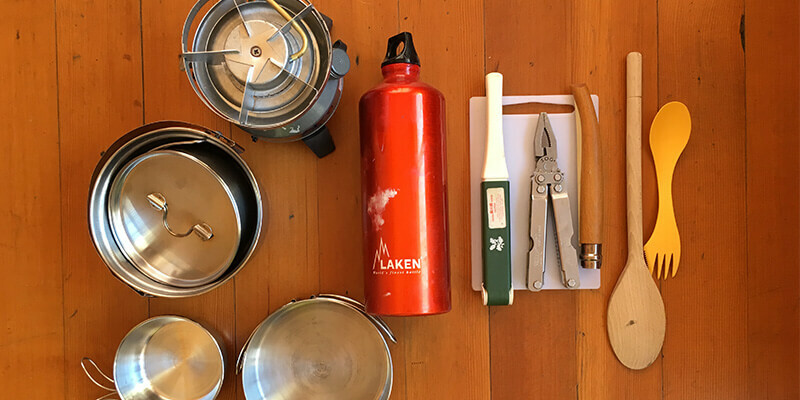 This “little” kitchen is suitable for a hike or a random “out of the blue” road- trip that may involve a few stopovers and some camping,it can be packed into a small container for a road-trip or a rucksack when hiking. A good hot meal can be extremely satisfying and provide warmth and much needed energy.Regardless of the purpose of your bush meal a proper set of utensils and tools will make cooking much easier. So lets look at a few essentials that are light and easy to pack but will still allow you to cook a decent meal and eat in comfort. Firstly the stove,whilst compact gas stoves may seem first choice one can run out of gas and be left high and dry without a spare canister ,generally when you are looking forward to that hot meal or cup of coffee. For this reason I prefer a dual-fuel stove such as the Peak brand that is able to use either benzine or paraffin , fuel I carry in a lightweight sealed aluminium container( Laken) , pots and pans are also lightweight and stackable and adaptable, the smaller pot can be used as a pot or coffee cup,whilst the lid can be used as a pan or plate( Peak). For a knife I always take a multi-tool as it offers a good cutting blade as well as a can opener. I back this up with a French Opinel knife and a small cutting board, I use a stainless steel Opinel as the blades do not darken when wet like the carbon variety. For cutlery I use a set that contains a knife,fork and spoon and the handle even allows for the storage of salt and pepper. Generally I also carry a “Spork” which is a combination spoon,fork and knife.I always pack a wooden spoon but think that I should shorten the handle to make it easier to pack. For washing up I carry a small bottle of eco friendly concentrated soap and a small lightweight towel for drying up, when space permits I carry a small foldable basin as well. Its important to keep your equipment clean and fat free as dirty utensils etc could result in a tummy bug and no-one wants that when travelling!